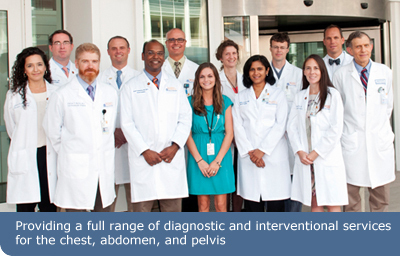 The Division of Body Imaging consists of the Abdominal and Thoracic Imaging Sections. 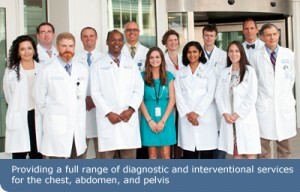 We provide a full range of examinations in both inpatient and outpatient settings. Our primary focus is the diagnosis of diseases and disorders of the chest, abdomen, pelvis, as well as the gastrointestinal and genitourinary tracts. The division is comprised of various sections and practices, such as Thoracic Imaging, Body CT, Body MR, Ultrasound, and GI Fluoroscopy. Our physicians use plain radiographs, computed tomography, and magnetic resonance imaging and they perform image-guided needle biopsies and drainage procedures. There is a dedicated procedure service, and physicians assigned to that service during the week (or over the weekend) do all procedures of the chest, abdomen, and pelvis. Consultative services are also provided for difficult cases to determine the imaging strategy best suited for the situation. The Division of Body Imaging is firmly committed to providing an exceptional level of service for our patients and referring physicians, helping to ensure that each patient has the best possible experience while in our care. We also ensure that our referring physicians receive high-quality radiology reports as quickly as possible, and are immediately available to discuss imaging results.